She didn't! This isn't the same canvas. Having looked at the first version I decided it needed a little bit of green with the pink. I suspect this was partly on account of passing an apple tree on my way to work and admiring the blossom. I think I'm happy with the green. I also changed a stamp which looked like it didn't belong. I have to say a huge thank you to Sharon Neill here because I wouldn't have been able to improve on my initial effort without her advice on how to apply the tissue and what gels and inks to use. The base coat is Adirondack Sandal Dabber and a red acrylic borrowed from my son's A level Graphics kit. I mixed up the green from some of his other colours (oddly, not blue and yellow!) and added that in. The next stage was the stamping onto tissue. I used Blazing Red and Jet Black Stazon. The stamps were from Beeswax, Crafty Individuals, Judikins, Hot off the Press and Elusive Images. My first attempt used Golden gel medium (gloss) but I decided I didn't want the 'brushed' texture so I changed to Mod Podge. The Heidi Swapp leaf masks were kindly donated by my good friend Lesley and the inking over the top is Brilliance in Crimson Copper, Pearlescent Crimson and Pearlescent Poppy. Jo, I don't know what to say except that I'm so proud of you. This is absolutely wonderful and you wanted a masking technique tutorial from me? Oh no! The other way around methinks! 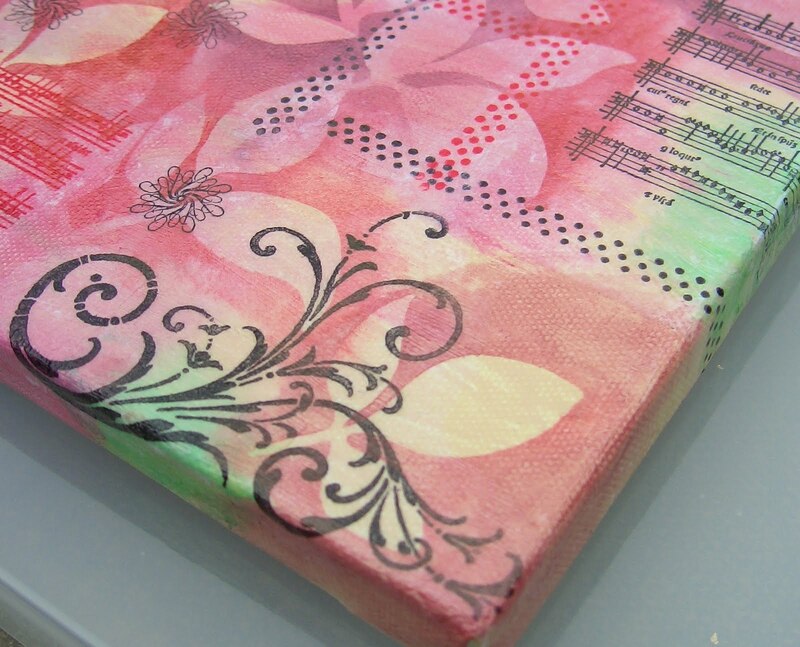 I love all the elements you have used on here and you application of the tissue to the canvas is superb. I can't see the joins anywhere and the colours are stunning. You really have done us proud my friend. It's a good job because so far my attempts are none starters and are only fit for the bin. And I chose the project too. Well done for finishing your project ahead of the rest of us. I love your colours, that pink is so rich and warm and the masking is really brilliant - I love the depth of the effect you have achieved here. You've done really well pulling all these elements together - lots of stamps, but it works together really well. Just stunning....oh how wish I could create something like this! This canvas is beautiful and I love the overall effect with the leaves and music. Things usually do look better in real life than when scanned or photographed. Looking forward to seeing the others too. The green really works well doesn't it! It makes the other elements 'pop', and is also visually appealing. It was a pleasure to answer your query. Please feel free to contact me in the future should you wish. I'm only too happy to help. This is beautiful! Love the layers of stamping and beautiful colors!